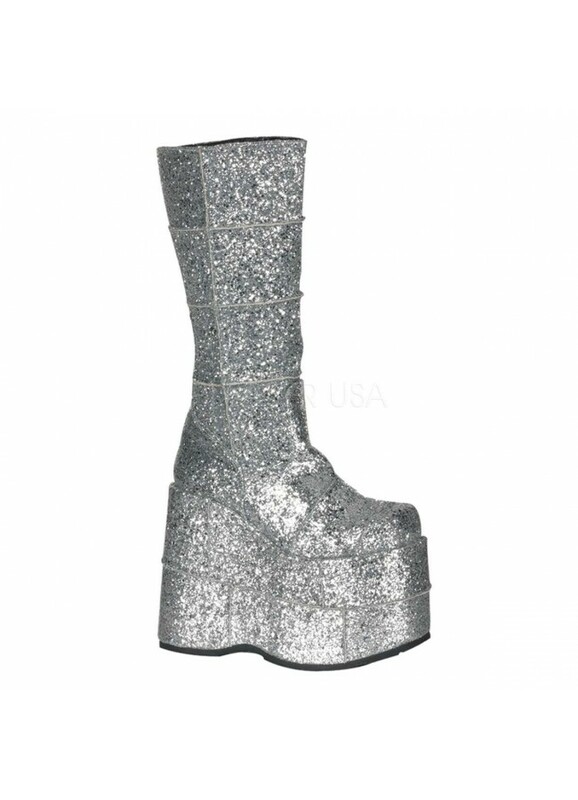 Silver glittered covered stacked boot is a favorite for on stage! Men's knee high boots have 7 inch heel. These boots have a super high 7 inch platform heel with patchwork exposed seams and full inner zipper and are covered in silver glitter. Item Number: PL-STACK-301G | Approximate Size (Inches): 12.00 wide x 14.00 deep x 8.00 high | Approximate Shipping Weight: 6.00 lbs. Calf Circumference 15 inches (38.0 cm). Calf circumference measurements were taken at the fullest part of the boot shaft and based on a women's size 7. Shaft Height 13 inches (33.0 cm). Boot shaft height measurements were taken from where the upper meets the heel to the top of the boot shaft on a women's size 7. Does NOT include the heel or platform height.